Ana Amiguet is a former Montessori student from early childhood in her native Puerto Rico. She has since worked as a lead teacher in Primary classrooms in California and Massachusetts, and at nonprofits both working with and advocating for children in foster care. She has a BA in English Literature from Brown University, an MA in Montessori Education from Loyola College in Maryland, and an Association Montessori Internationale (AMI) diploma from the Montessori Institute of San Diego. Ana joined the Anami team in 2013 as the teacher in Children’s House II. Her favorite aspect of classroom life is the three-year cycle that allows for in-depth relationships with each child. First year child in Children’s House II explores building with the Pink Tower. As a teacher and parent, one of my greatest challenges lies in taking a step back, instead of forward, in the face of a child’s struggle. It happens on a daily basis—whether the three year old unable to zip his jacket, or the five year old stumped by a math problem, the opportunities for our “help” are endless. As caregivers, we wish to spare the child suf-fering. However, maybe we should take the time to rephrase our thinking. Are these really struggles that need our res-cue? Should we not ask instead what this child might gain from overcoming a challenge? “Character formation cannot be taught,” writes Montessori. “It comes from experience and not from explanation.” For a child to have a true experience, she needs to be allowed to make mistakes. 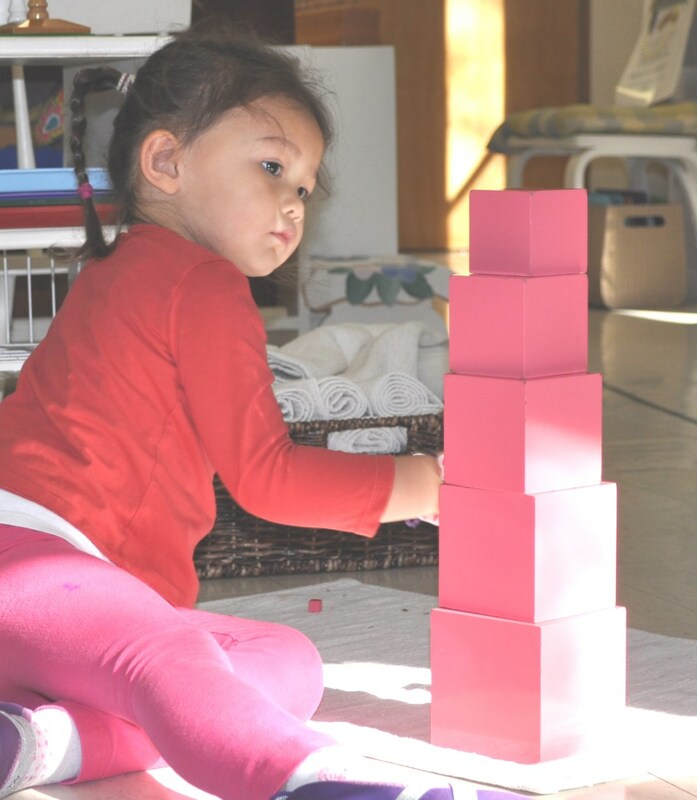 During a recent parent-teacher conference, we discussed how a child is not born knowing that she cannot build the pink tower with the smallest cube on the bottom. It is only through making the attempt, and experiencing the tower’s inevitable collapse, that she will learn that it cannot be done. As she approached it with the curious mind of, “I wonder what happens if…?” she has not done something “bad” or been permanently scarred from “failing” at the pink tower; she will simply try again. And it is through the trying that she discovers the myriad possible ways to build the pink tower. It is often beneficial to consider beyond the actual skill prac-ticed (whether building the pink tower, getting dressed inde-pendently, learning to read or working on a puzzle map), and look to the bigger question: what life skill is my child learn-ing? Is he learning that he is a capable being? Is she making mistakes and learning from them, or is she making mistakes and giving up? Is he able to take on a challenge and perse-vere, or does he look immediately for adult assistance? Mon-tessori writes, “No adult can bear a child’s burden or grow up in his stead.” Are we allowing our children to be agents of their own growth, mistakes and all?